This is a book where the publisher compiled adorable photos of animals – with some close-ups worthy of Cute Overload – and added simple text. Each page is told from an animal’s perspective. How you’ll feel about this book ultimately depends on how you believe farmed animals should be portrayed. I am divided on this issue. On one hand, I want kiddo to know how animals are treated on factory farms where the vast majority live. On the other, why expose her to such ugliness at such a young age? 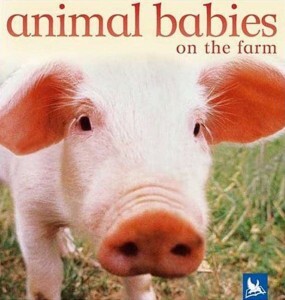 This book is about who animals are, not how we treat them. The animals in this book are portrayed with their mothers, and often their siblings, in sanctuary-like surroundings. The words emphasize the bond between the baby and her mother. In the end, I decided that I liked this book, but I’m curious: what do you think?